If you were a kid in the '80s then these three cartoon reboots should bring back some memories. Back in the '80s, there were very few cartoons aimed at girls, and a female action hero was a rare treat. At six years old, I had a poster on my bedroom wall of She-Ra riding Swiftwind (her rainbow-winged flying unicorn), as well as a She-Ra outfit complete with plastic tiara and sword (good for fending off older brothers who try to steal your Easter eggs). I have a lot of fond memories of the 1985 series and was very, very excited for the 2018 reboot. It did not disappoint me. 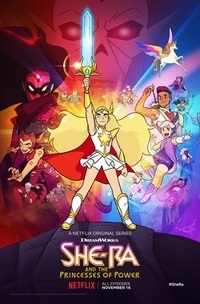 She-Ra and the Princesses of Power, which is currently streaming on Netflix, is executive produced by Noelle Stevenson, the author of the comic series Nimona and Lumberjanes. The show retains the spirit of the original series with a few updates. Adora, who is 16, looks much more like a teenager, and her outfit is a bit more sensible, with flat soled boots and a sleeveless top instead of a bustier. There is a bit more diversity among the cast, with women of different shapes and sizes (making it easier to tell them apart compared with the original series where you sometimes had to go on their outfits) and the inclusion of people of colour. There are also a few differences minor differences in the plot. She-Ra and the Princesses of Power is an action-packed, fun TV show, suitable for both children and nostalgic adults. Transformers Cyberverse logo, via Wikipedia. Fair use. Transformers is the story of two rival factions of living robots, named the Autobots and the Decepticons, fighting a never-ending civil war. The robots are able to transform from humanoid shapes into vehicles such as cars and planes, and sometimes dinosaurs or other animals, which made for some very cool toys. The wildly successful Transformers franchise, which has spawned a number of animated series, comic series and live action films, has had another reboot with Transformers: Cyberverse. The new series, produced for the Cartoon Network, centres around Bumblebee, who has amnesia. His partner, Windblade, helps him to regain his memories, and they try to save their friends while Decepticon assassins hunt for them. I haven't seen this one yet, but I'm up for it since it sounds like we will be seeing a lot of Bumblebee, who was always my favourite character. The 2018 reboot, which is airing on the Disney Channel and Disney Junior, features most of the same baby muppet characters as the original series (Kermit, Piggy, Fozzie, Gonzo and Animal, with the addition of a chick named Camilla, who is Gonzo's best friend and a new baby muppet called Summer Penguin. They are watched over by Miss Nanny, voiced by Jenny Slate (of Obvious Child, Brain on Fire and Parks and Recreation). Statler and Waldorf also appear as Miss Nanny's neighbours. If there are other upcoming reboots of 80's shows you're keen to see, please post about them in the comments. Why? Because the icons of your childhood live again!